Hardwood frame, reinforced for structural integrity. Seat and back suspension uses a combination of Italian webbing and no-sag springs providing superior comfort. 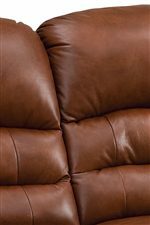 Foam and fiber filled cushions provide luxurious comfort the moment you sit down. Individual pocket coils in every seat cushion. High Resiliency foam provides long lasting comfort and support. Garnetted poly fibre sewn into a separate pocket. Fiber wrapped to provide a soft front edge. Supportive wood stretcher with padding ensures quality construction. The Taurus Casual Theater Seating by Palliser at AHFA in the area. Product availability may vary. Contact us for the most current availability on this product. 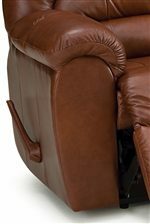 41093-A1 45 Degree Wedge 2 36" 36" 36"
41093-10 Armless Chair 2 23" 39" 41"
41093-47 LHF Recliner 1 33" 39" 41"
41093-46 RHF Recliner 1 33" 39" 41"
Tailoring Casual tailoring with split back cushions and pad over chaise seating. Arm Plush pillow top arms. Make an easy going lifestyle a dream come true. This cozy casual upholstery encourages stress-free living, with many reclining options, and convenient features such as built in table surfaces, cup holders, and storage consoles. Brought to life with over 100 covers in both leather and fabrics to choose from. The Taurus collection is a great option if you are looking for Casual furniture in the area. Browse other items in the Taurus collection from AHFA in the area.